Greek Salad is the most delicious salad, fresh, healthy and wonderful in taste. This Greek salad recipe consist of tomatoes, cucumber, onion, olives, feta, oregano and gets a crunchy boost from lettuce. This healthy Greek Salad is so easy to whip up, and it’s absolutely amazing when tossed in a light and refreshing lemon-olive oil dressing! It is easy, healthy, colorful, and completely delicious especially when drizzled with lemony dressing. You can include this healthy dish into your lunch or dinner as side, it just perfect or you can just stuff it into your sandwich or wrap it with taco/tortilla. After eating lava cake and had lots of calories, finally today I decided to go with clean eating low calories food and you know all, well salad is the best option for that, but plain salad, eating like animal……ewiee no way…so I made lemony dressing, it gives your salad taste just awesome tangy, and little peppery flavor just love it. 1. In mixing bowl add chopped onion, tomatoes, cucumber, lettuce, parsley, black olives, feta cheese and mix it well. 2. Now sprinkle black pepper powder, salt, mix it well and keep aside. 3. In another small bowl add olive oil, lemon juice, sugar/honey, oregano, garlic powder, salt and stir it well then keep aside. 4. Mix the dressing just before serving into the prepared veggie salad. 5. You can serve it fresh or store it into a refrigerator and serve later chilled. • You can use chopped coriander/cilantro instead of parsley. • You can add chopped bell pepper and pomegranate too. • Use virgin olive oil for best result. • You can add freshly chopped mint leaves into the salad for minty flavor. Greek Salad is the most delicious salad, fresh, healthy and wonderful in taste. This Greek salad recipe consist of tomatoes, cucumber, onion, olives, feta, oregano and gets a crunchy boost from lettuce. This healthy Greek Salad is so easy to whip up, and it’s absolutely amazing when tossed in a light and refreshing lemon-olive oil dressing! In mixing bowl add chopped onion, tomatoes, cucumber, lettuce, parsley, black olives, feta cheese and mix it well. Now sprinkle black pepper powder, salt, mix it well and keep aside. In another small bowl add olive oil, lemon juice, sugar/honey, oregano, garlic powder, salt and stir it well then keep aside. Mix the dressing just before serving into the prepared veggie salad. You can serve it fresh or store it into a refrigerator and serve later chilled. Wow colorful Salad great for summer!! Thats a super delicious and colorful salad binjal. Would love to do this in future.I am inviting you to participate in the giveawy happening in my blog. Hope to see you there. What a delicious and refreshing salad Binjal! Love every bit of it!! Lovely mix of colors and love the sauce.. Yum! 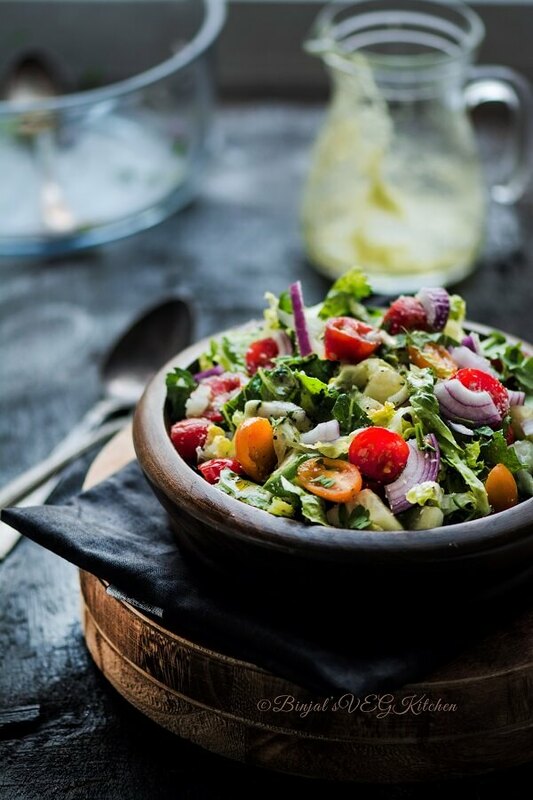 as much as i love salad, i’m loving the beautiful photography too Binjal.